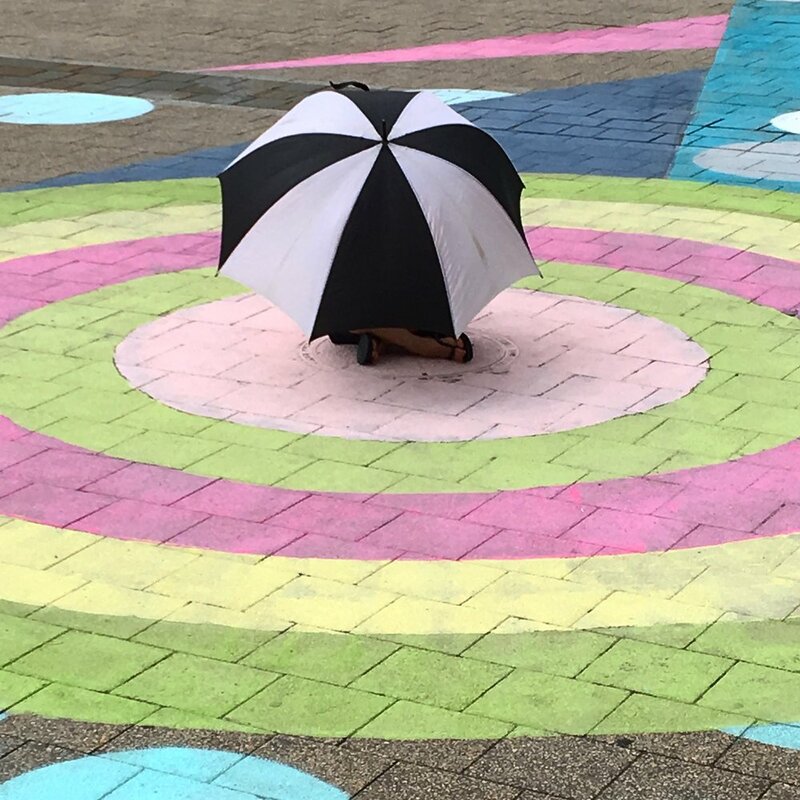 The artwork ‘We Dance Together’ in Civic Square was a collaborative graphic intervention project created for Design Canberra Festival 2017. The work was designed by local artist Jodie Cunningham and painted by herself, Geoff and Pete Filmer from Graffikpaint, and volunteer Project Coordinator Sara Edson. 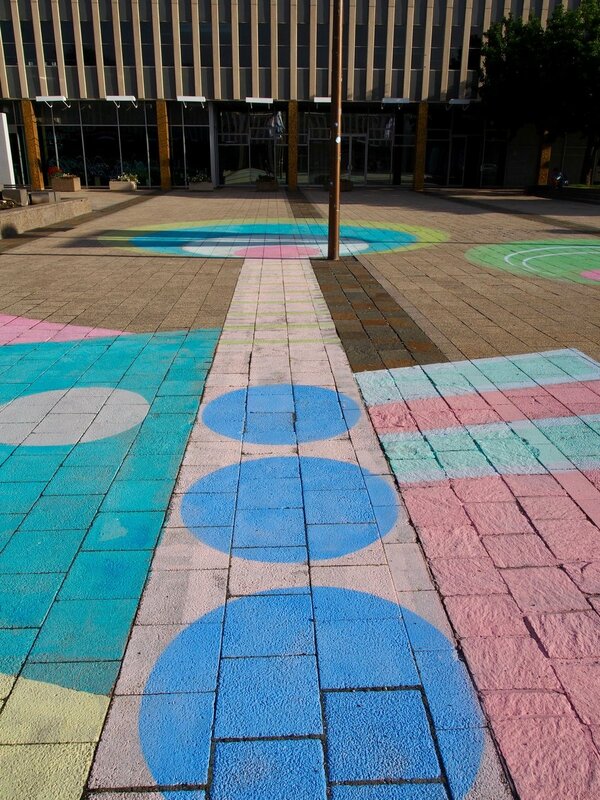 It was a large scale public artwork painted with brightly coloured chalk paint in the centre of Civic Square, Canberra. The artwork was an assemblage of abstracted geometric symbols referencing modernist aesthetics, Canberra's iconic architecture -including the Civic Square precinct; and cultural symbols for community, strength and connectivity. It payed homage to the history of Canberra, in particular Mid Century Modernism and the earlier Art Deco period, drawing on patterns and colours from architectural forms and interior decor. 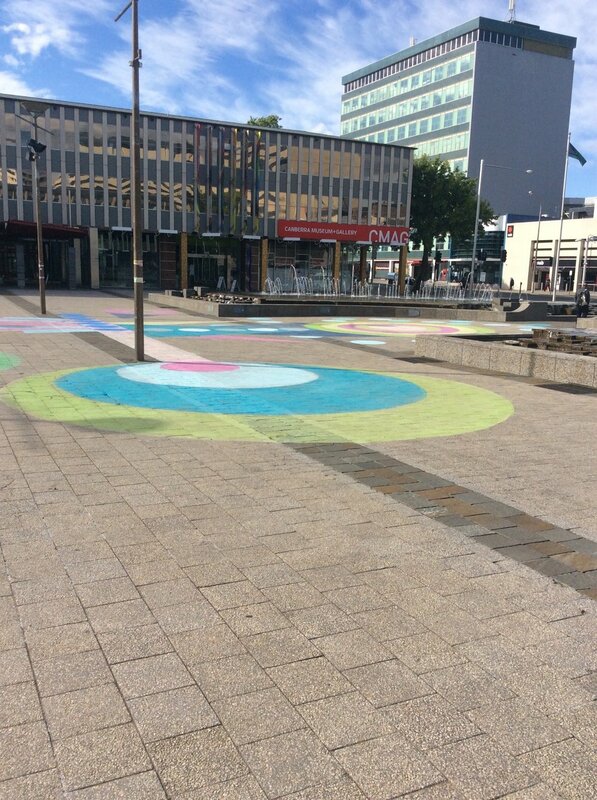 The artwork invited viewers into the square through the fountain via 'stepping stones' of aqua and lime circles and encouraged people to dance on its geometric shapes, celebrating the commonalities that bring us together. Specific references included the triangle of the flag poles of Parliament House, the pattern from midcentury brick garden dividers, the deco fan from canberra’s first public buildings ( Parliament House, ainslie school, canberra high- now canberra school of art) ovals of transformation, circles of infinity, the Greek symbol for strength; and clusters and lines of dots representing groups of people.